O holy chorus! O hallowed battalion, O unbroken fighting order! O common guards of the human race! Good companions in time of anxiety, helpers in prayers, most powerful ambassadors, stars of the world, flowers of the churches. The earth does not hide you; instead, heaven accepts you. The gates of paradise have opened for you. The sight is worthy of the army of angels, worthy of patriarchs, prophets, the just. Men in the very flower of youth, despising life, loving the Lord above parents, above children. Having the vitality of their age, they looked down on the temporary life in order to glorify God with their limbs. Becoming a "spectacle for the world and for angels and for human beings" (1 Cor. 4:9), they raised the fallen, they strengthened the ambivalent, they doubled the desire of the pious. All of them raised the one trophy on behalf of piety and were crowned with the one crown of justice too, in Christ Jesus our Lord, to whom be the power and the glory forever and ever. Amen. 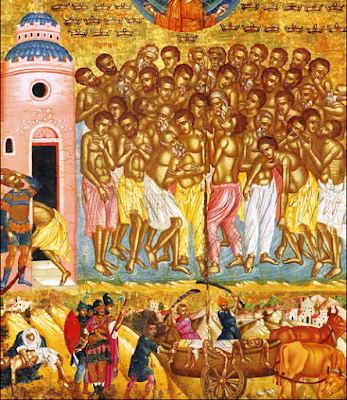 From A Homily On the Holy Forty Martyrs of Sebaste.